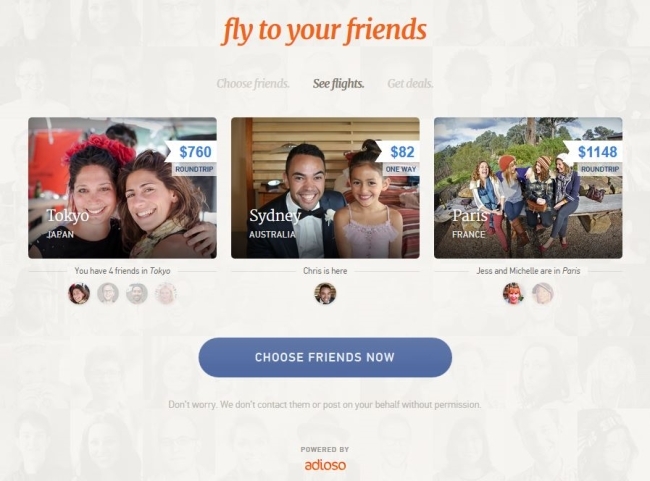 In a unique take on Facebook travel applications, Fly to Your Friends from flight-search tool Adioso allows users to select friends they wish to visit and sends them email alerts when prices to those friends’ destinations are at their lowest. 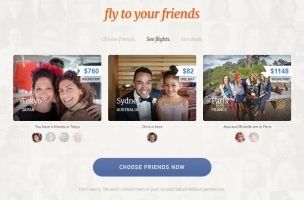 Fly to Your Friends users can customize settings, such as setting price caps, or specifying relational data, such as “flights to see friends in San Francisco in April are now $100 cheaper today than yesterday.” The default settings are weekends (Friday through Sunday) for friends in the same country, and one week for friends in other countries. Y Combinator-funded Adioso pointed out that Facebook does not currently provide views of users’ friends grouped by city, adding that the “most basic strength” of Fly to Your Friends is its ability to reveal the real costs associated with visiting far-flung friends. Our belief is that people would love to find opportunities to visit their friends — it’s just that they haven’t been aware of the costs, or, more valuably, they haven’t been provided with an interface in which to see the best deals, times, and price changes. With Fly to Your Friends, users can make informed decisions about how and when they can visit friends most frequently. Adioso wants to make the details of visiting friends transparent and accessible to those of us with busy lives. Adioso’s platform allows us to continuously examine millions of fare combinations over hundreds of days to surface the best possible fares to your friends at any given time. Our platform ingests fares for hundreds of airlines from a combination of sources, and then sorts and combines them to surface the best deals. Our internal search engine (named Wingtip) is also capable of tying together multiple fares from competing airlines to assemble the best possible route for the traveler. Readers: Will you give Fly to Your Friends a flier?